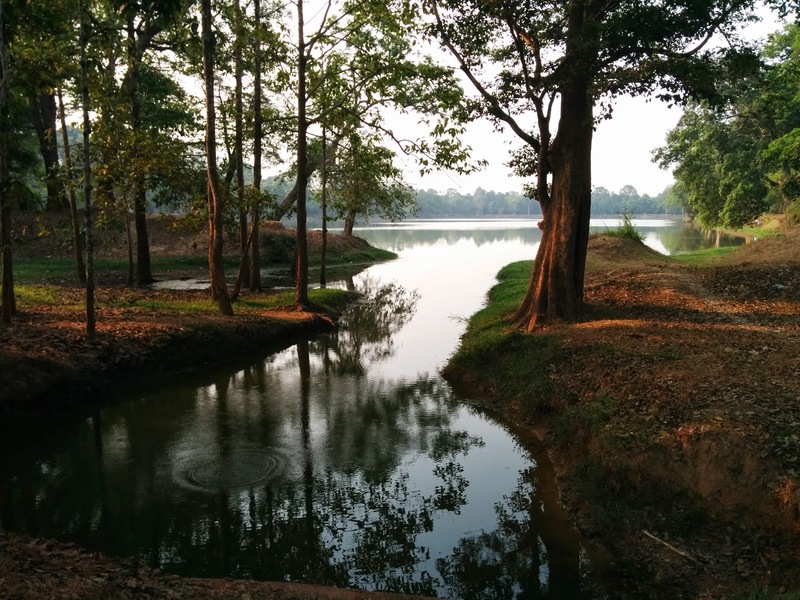 This post is part of the A2ZChallenge, which I'm doing this year on my recent trip to Siem Reap in Cambodia. Is it possible to get goosebumps on one's heart? Because if it is, then I have them. I'm walking down the causeway towards Angkor Wat. Those famous tiered spires, the ones I've been dreaming about for months now, are ahead of me. The eastern sky is still lightening, the spires are mere dark outlines against the greyness. Dozens of tourists throng the causeway ahead of me. Hundreds more wait by the pond to the north, waiting to take their own personal version of that legendary photo of Angkor Wat reflected in the waters of the pond. We leave our hotel at five in the morning. The tuk-tuk takes us through the empty streets of Siem Reap to the entrance of Angkor Archaeological Park. Huge and forested, the Angkor Archaeological Park is almost a museum of cities. The Khmer kings, who ruled this area between the ninth and the sixteenth centuries, believed in building a fresh capital city for each new king. Each capital city had at its center the state temple. Thus, many large temples dot the park, each appearing almost like a mirage of grey stone in the middle of the forest. Angkor Wat and the other temples are a few kilometers further inside from the entrance of the park. The ride through the dark forest in the morning is an experience not to be forgotten - the cool morning, the lightening sky, the sound of crickets on all sides. Over-taking and being over-taken by cars and vans and buses and tuk-tuks full of other tourists like us, all headed towards one temple, all intent on catching Sunrise at Angkor Wat. Angkor Wat (The City that Became a Temple) was built in the first half of the twelfth century by the Khmer king Suryavarman II. Initially a Hindu temple, Angkor became Buddhist later when the latter religion swept the region from the thirteenth century onward. The temple is unique in that, unlike other Hindu temples which face the rising sun, its entrance is towards the west. 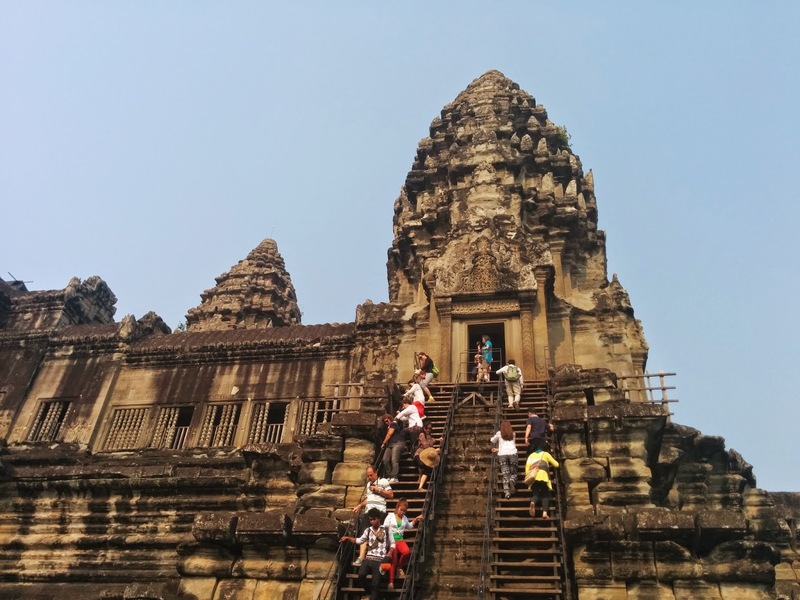 Like most of the temples that the later Khmer kings built, it is in the form of a stepped pyramid with three levels. The three enclosures all have four entrances, one in the middle of each side. The pyramid was the Khmer way of symbolizing Mount Meru, the center of the Hindu universe. Hence, it's called a 'temple-mountain'. Because of this symbolism, Angkor Wat was situated at the exact center of the capital city, and the city walls today form a fourth enclosure, with a moat outside it. All the other buildings of the city were made of wood, and have perished in the eight centuries since (and hence the City Became a Temple). Our tuk-tuk driver drops us just outside the city's moat. 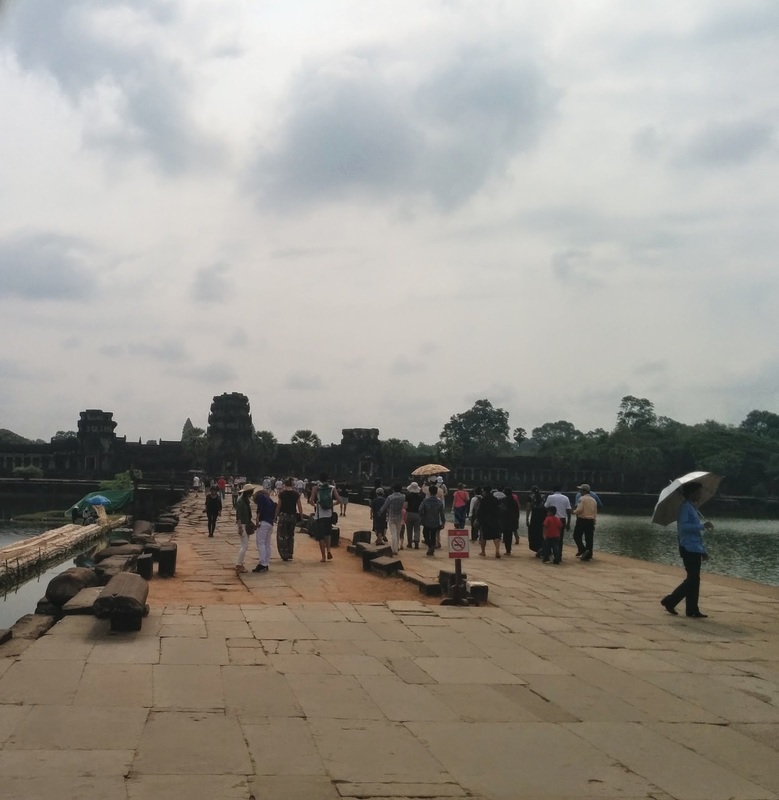 We walk down the causeway towards the western gopura in a daze, mesmerized by the prospect of seeing Angkor Wat in a few minutes, not even realizing in the dark that there's water on either side of us. The western gopura is huge, but we don't care - we're eager for our first glimpse of Angkor Wat. Crossing the gopura, we reach another causeway at the end of which, finally, we can see three of the five central spires. A long walk down the causeway, and we're at the third (the outer-most) enclosure. 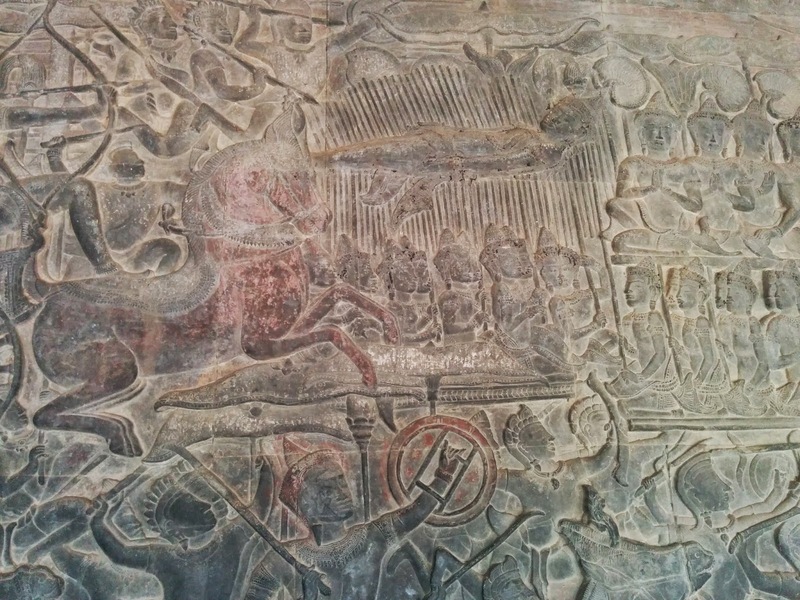 It's a sort of gallery, with walls in covered exquisite bas-reliefs from the Ramayana and the Mahabharata and also from the reigns of one of the Khmer kings. Between the third and the second enclosures on the western side is a hall with multiple stone basins. It used to be lined with statues of Buddha, placed there in later centuries by Buddhist worshipers, and was called the Hall of the Thousand Buddhas. These were either removed or destroyed during the Khmer Rouge reign of terror. Only a few statues still remain. Entering the second closure, we see a large open space. On either side are small buildings called 'libraries'. I don't know if they originally served the purpose we associate with libraries today. The steps up to the inner-most enclosure are steep and not in very great shape. In fact, they're so terrible that, of the four sets of stairs leading up to the central enclosure (one on each side), we are only allowed to use the stairs to the east, where a new set of wooden stairs have been built. These stairs don't open till seven-thirty. Also, be warned - wear tops with sleeves and bottoms that cover your knees, otherwise you won't be allowed in. The innermost enclosure appears small and crowded after the outer two. This level is the one with the five iconic spires - the central shrine and four corner towers. The central shrine used to contain a large statue of an eight-armed Vishnu; but a Buddha statue replaced Vishnu during the later Buddhist era. 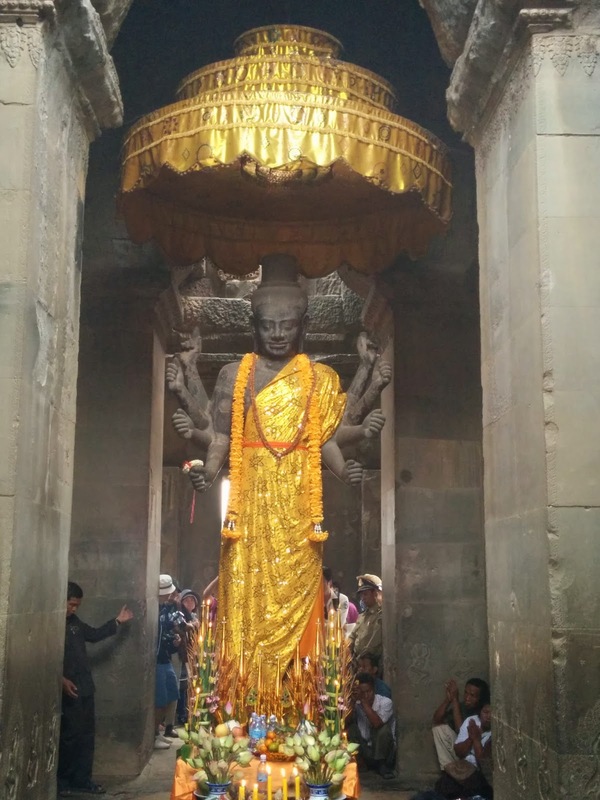 The Vishnu statue now resides in a small shrine south of the western gopura. Climbing down, we take a walk down the causeway to the east, to the eastern gopura. This section has not been restored as well as the western section. The gopura is in terrible shape, and the walls are nowhere to be seen. Outside the gopura is the moat again. We walk back, and then walk to the northern side of the temple in search of some food. There are food stalls here, and we have been specially invited by one Mr Tiger Woods, who told us that he runs stall number one there. We see that Harry Potter also has a stall there, as do numerous other celebrities. In fact, I also over-heard a guide introducing himself to a tourist as 'James Bond - Licensed to Guide'. The restaurants are highly priced by Cambodian standards - five dollars for a single dish. When we hear the price, we walk on; surely we can get cheaper food elsewhere. The stall owners run after us quoting smaller rates. One girl is particularly persistent - 2 dollars per person, she says. We debate, decide we're not quite hungry yet. We buy a bottle of water and walk on. Of the dozens of temples in the Angkor Park, why is Angkor Wat the most famous? So famous, in fact, that most people (including us initially) think that the entire park is named Angkor Wat? Several reasons, I think. For one, Angkor Wat is certainly the best preserved (or perhaps the best restored). 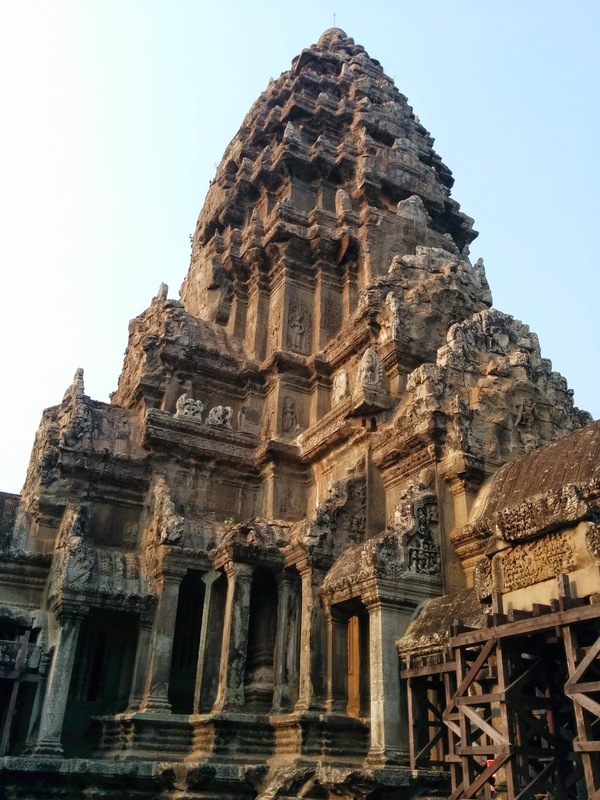 Secondly, since Angkor Wat was built later than most of the other Angkor temples, the Khmer kings seem to have taken the best elements of the other temples, made them even more majestic and brought them all together at Angkor Wat. More prosaically, the fact that it's closest to the park entrance means that our energy levels are slightly higher at Angkor Wat, and we're able to appreciate it much better. And so. That's one item off the bucket list. On now to the next city, and the next set of temples. Wow Devika, first up - I am so jealous :-P A Laos- Cambodia trip has always been on the cards, but have never gotten around to actually doing it. That is such a detailed post! I would have normally skipped a post this long, but you had me right till the end! Good luck with rest of the challenge!